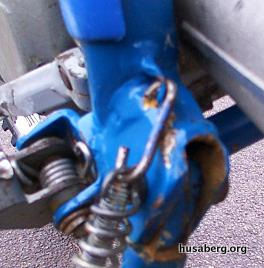 This information is generally accepted for all Husaberg motorcycles. This section covers wear items that are considered Amber Alert. For additional wear items, reference the Red Alert section for Husaberg motorcycle wear. For 3 years, owners struggled with weak starters that were classified as ‘restarters’ and only to be used after the engine was warm. Typically, the starter would spin through and not quite ‘catch’ the engine and batteries went flat quickly. There was an error in the 2003 parts manual whereby they simply failed to realize that the whole set up had been upgraded for that year. 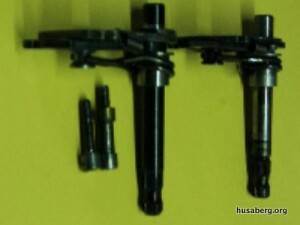 The parts book was corrected in 2004 when Husaberg went to the present Parts # system. Don’t mix the ‘sets’ of parts! By matching the old and new, it should be very easy to get the right parts. But remember, the sprague was only 40% of the problem for owners wishing to have good electric starts! The battery needs beefing, the starter motor wants beefing and with the new starter, owners need a new mounting bracket. Then we have the modified decomp which matches a later (2003) camshaft. The very first 2001 engines produced came with a very weak electric start Slip Clutch Gear Wheel. During e-starting, if the engine backfires, there is a good chance the gear will break and sometimes damage the Free Wheel Outer Part. If the engine stalls it can try to run backwards for a moment breaking the starter gear. 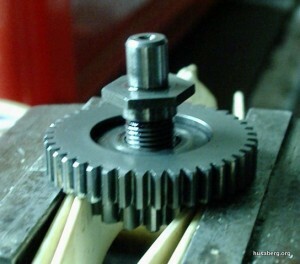 A updated starter gear was produced and covered under a warranty programme. Most early 2001 models were updated at the dealership level or by the motorcycle owner as they all would eventually break. The upated part number 250 283-01 supercedes the retired faulty part number. Reports of the updated warranty part breaking are almost nonexistant. There are potentially a few bikes out there that did not receive the update in the U.S. as the importer discontinued its affiliation with Husaberg during this period leaving a void for quite some time. Cryogenically treating the gear will add an extra margin of strength. This first appears on the 2002 engine and looks like an innocent little wheel ‘merely’ connecting the starter to the sprague bearing. Wrong! It is infact a clutch to stop a violent reversal going through the starter motor and the idea is that it should ‘give way’. Unfortunately it gives way when starting. To check it out, remove and hold in the vice via the large gear, use a torque wrench set on a vert low 12LB/10Nm and if it clicks off its good but if it turns it is worn. Even on 4lb the nut will turn rather than click the torque wrench. 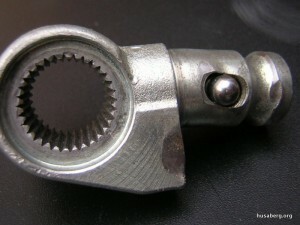 Now hold by the small gear and undo the 17mm nut with a 6-sided socket. 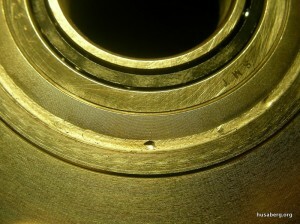 Add a .016″ (0.4mm) shim to the spring washer and it should be cured. 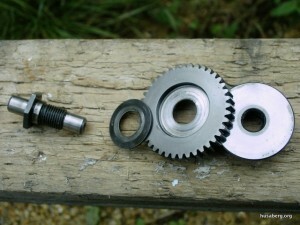 Husaberg Starter Slipper taken apart – Note the clutch material and the sprung washer is not sprung much! Mainly a 2000 – 2002 problem and easily fixed. Many engines will have had several new sprague clutches but some made a terrible racket! This is due to fitting the later starter free wheel hub into the earlier sprague bearing or vice-versa. The answer is simply to order the correct part to go with the rest of the set-up. The single bearing counterbalancer was replaced with a double bearing counterbalancer in late 2002. Counterbalancer failures were experienced on some 650’s and on a lesser amount of smaller displacement engines. A counterbalancer assembly is available to upgrade to the double bearing version. Included are: Counterbalancer, bearings, circlip and shim. 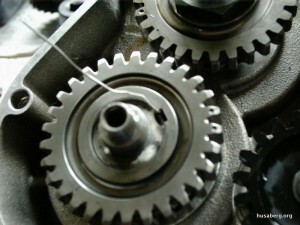 The 2003 counterbalancer cannot be used as teeth on the counterbalancer sprocket have a different mesh. The bearing can fail on the 501/650 engines whereas the 400 gets away with it’s single row because the actual balance weight is smaller and lighter giving the bearing an easier life. But there is now a solution and that is the single bearing that contains two rows of ball bearings: a kind of ‘duplex bearing’. Check out the 2007 Parts book for this upgrade. 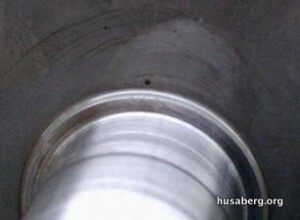 This bearing is very expensive to replace; however, Ausberg has discovered that the two bearings are in fact standard bearings machined down by 1mm each side to get the desired total width. With a drilled hole in all cranks from 2004 feeding oil to the balancer bearings: failures are rare. 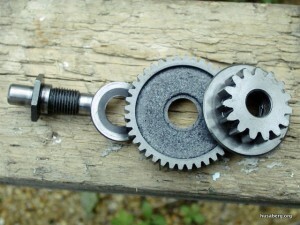 On some of the 2004 bikes, the machined keyway in the gear was wider than the key it fitted. If big enough, feed some lockwire down the side and hold still while tapping the gear on. Chop off with a carpenter’s chisel and then loctite the nut on. If there is no room for the wire then use plenty of loctite around the keyway. Unfortunately, when they get a bit older, the exhaust valve has been known to lose it’s head! Poor quality. Find a stronger one that uses spade fuses. May break or loosen. Need to be supported at headstock or will twist and break eventually. Very loose from new. The problem is that the ‘dzus’ screw’s thread is undersize. Seizing – don’t slide laterally. Pull rubbers back and copper slip 1-2 times per season. 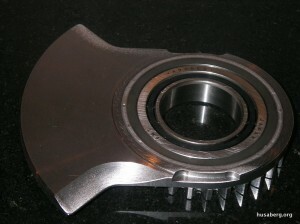 Lower heim bearing. Needs to be stripped and greased mid season or expensive to replace. The selector “claw” metal is too soft. Separate the “claw” from the plate, rub away edges and burrs. 2004+ is made from hardened steel and has a darker color (Dsducati). Note the 2 tiny screws, the newer spring makes the shifter taller, initial attempts to fit show the longer screw and the brass collar supplied (on the right in the photo) are too tall and hit the underside/outer edge of the clutch gear teeth. So keep the original screw, narrow the head down to just the width of the dowel and re-use. Clutch drum gets grooved badly. This stops the plates moving apart and ‘free’ from friction plates. The 2003 had steel dowels and different ‘steels. The 2001 and 2002’s can be cheaply upgraded at replacement time. Made shorter by 10mm. Sidestand bouncing over bumps smashes into underside of tailpipe. 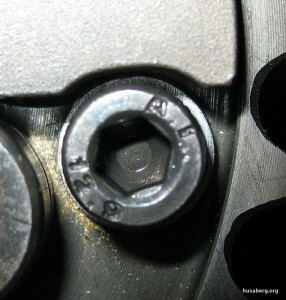 Stronger tension on spring now increases wear at pivot bolt though. Hole wears oval. Weld thicker steel. Shouldered bush. Right through both plates and sidestand, also bush sidestand. Whole unit is more rigid and wear area is larger and more successful. Thick plates on the side, a bushed stand using a shouldered dowel. The hook was shortened because the stand bounced up and down while racing. Still need to do something about that eye for the spring though. Zip-tie to front plastic mount. Otherwise will jump out and weld to exhaust. Loctite into frame. Otherwise they spin out with radiator sidepanel bolt. Drill louver/dowel together. Fit a small self tapper just ahead of the radiator sidepanel screw. All cams up to 2003 had a vicious ramp that made the valves bounce as well as tulip. The cam was changed for ’03. Always rebuild with the later Cam coded ‘000’ in the parts manual. Not too many of these on the little 400. Center exhaust section sits on the joint. 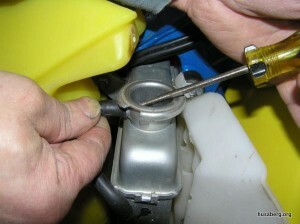 Raise exhaust with a jimmy bar and pinch tight. This can be a rare problem on machines prior to 2004. The bike is difficult to start, MAY make a slight tick-tick noise and can give the same or similar symptoms as the SEM ignition or carb troubles. Here is an idea of what to look for. 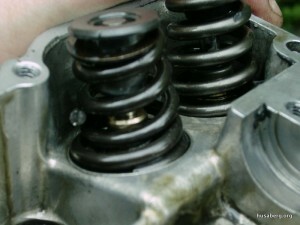 Broken valve spring (can be seen on the lower left) with guide seal wrecked! The 2001 and 2002’s again! Seats hammer, valves pull through the seats. It will show in the tappets needing slackening all the time. You will need new valves and to have the seats “kissed”. Improvements in material have stopped this completely with the help of the new cam design.